It’s in a cemetery, after all. 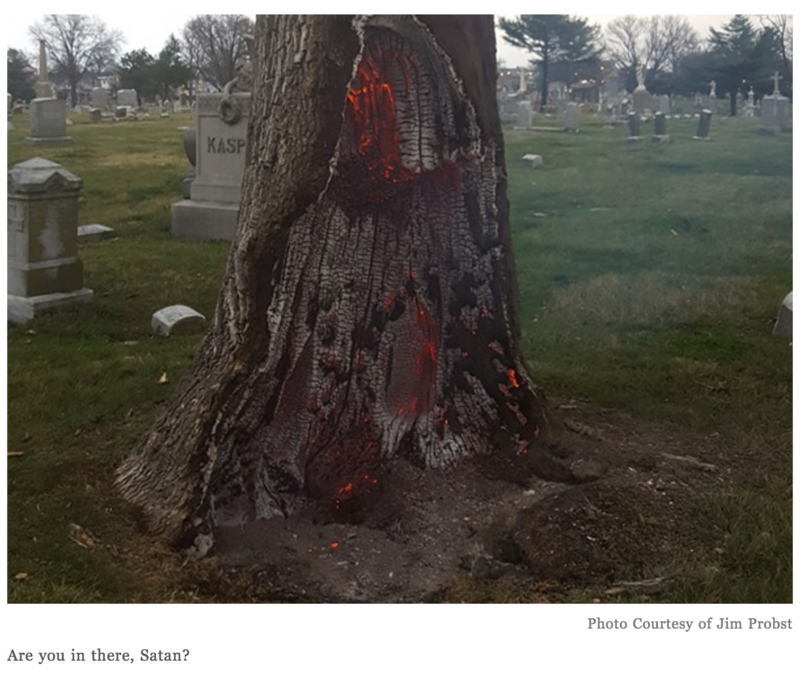 “Are you in there, Satan?” reads the caption on that post’s opening pic. What a wonderful e.g. to use in a class to explore the conditions necessary for certain explanatory frameworks to be used and seen as credible. 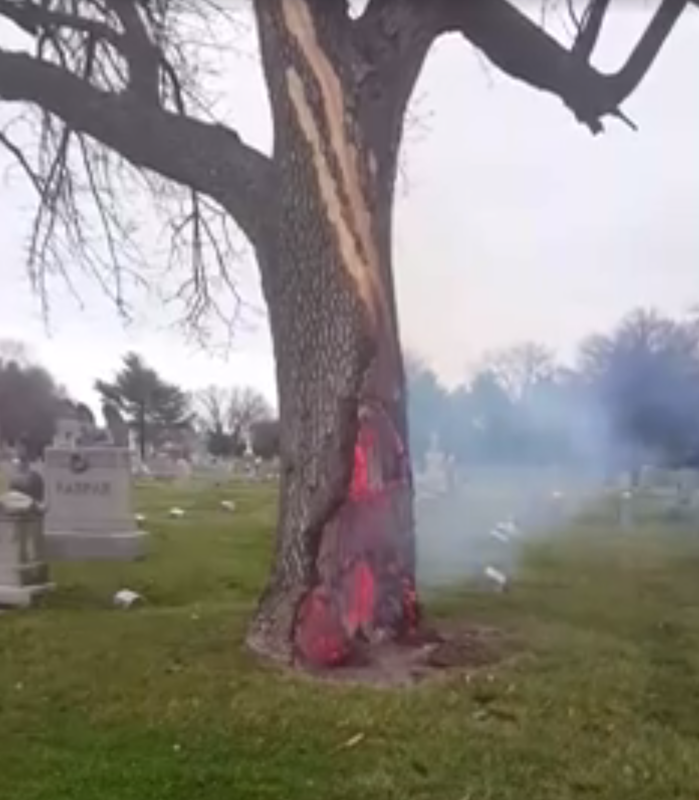 For, as the news story notes, the fellow who filmed it in the morning, while walking his dog, had heard a crack of lightning around 2 a.m. That, coupled with the vertical pattern on the bark, etc., leads one to reasonably conclude that the tree had been struck by lightning. then we at least have a handy tool to manage all of the competing accounts. But we don’t always opt for the explanation with the simplest set of assumptions, do we? And, if you think of it, what gets to count as simple? For it takes quite a bit of theoretical acumen to wrap your head around the notion of lightning, what with the need to understand the reasons for, and effects of, such complexly intertwined things as hot and cold air masses moving and colliding, charged particles in the atmosphere, the jet stream, ocean currents, even the moon’s gravitational effect on our planet, etc., etc. In fact, given all that it’s not irrational to think that the deeds of powerful, invisible beings helps to account for some things in a far simpler manner. After all, people routinely tell kids that thunder is god bowling, no? They do so assuming that the meteorological account is just far too complex for them to handle. So which is the simpler account? That tree in a graveyard would make a really elegant little e.g. to think through, with a group of students, how it is that we explain curious or anomalous things to ourselves and why we opt for this rather than that account. What makes the lightning strike explanation plausible and persuasive? And why (i.e., under what conditions) might one opt for a rather different way to make sense of it? For there’s billions of people, worldwide, who, for some reason, elect to explain seemingly mundane things by appealing to what others of us take to be some pretty exotic assumptions. This entry was posted in Faculty Blog, Relevance of Humanities, Religion in Culture and tagged Assumptions, Explanation, Lightning by Russell McCutcheon. Bookmark the permalink.